We serve a leisurely continental buffet and a full English breakfast. Our property offers you exquisite bird life of the area around us as you view the Knysna Heads from our deck overlooking the refreshing swimming pool, sauna that await you.The Garden Route of South Africa is a popular tourist destination and is famous for its beautiful scenery, magnificent beaches and a myriad of outdoor activities for the entire family and other adventurous spirits. Golfing is a very popular sport in the Garden Route, and our clients can enjoy golf at Simola and other golf courses, in close proximity to Waterfront Lodge. Other attractions in the Garden Route include the escape of the forest walks, boating, hiking, beaches, cycling, kayaking and lots more. 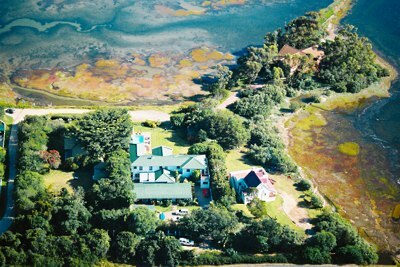 Knysna boasts a wealth of excellent restaurants, and shopping in the quaint old town of Knysna. If you need assistance in planning your itinerary, we are here for you. Click here to view current and short-term weather for Knysna. Guest Comments:Beautiful, Wonderful hospitality, had a great time. Great excellent facilities, Lovely hosts ,We enjoyed! Best accommodation so far in S.A,Great hospitiality . Perfect,excellent-so friendley hosts, Thank you. Perfect service and much help, very kind!